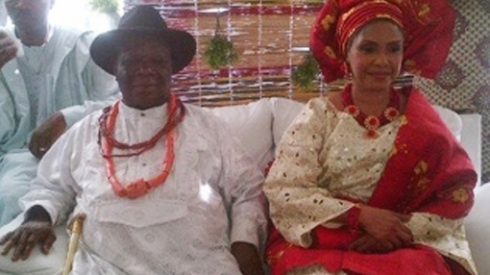 Ijaw Leader and former Information Minister, Chief Edwin Clark, who is 86, remarried last week to well known medical doctor, Dr Abisola Sodipe Akindeko. Some parts of the wedding ceremony took place at his home in Apapa and the others at the bride's home at Okupe Estate, Maryland. Dr Abisola Akindeko is the former best friend of Iyabo Obasanjo who lost two of her children in an assassination attempt on Iyabo Obasanjo's life. Dr Abisola's children were riding in Iyabo's car when it was attacked by hired assassins in 2003. The gunmen, thinking Iyabo was in the car, shot into the car killing the two children instantly. Iyabo and Dr Abisola had been riding in the doctors car, while the children rode in Iyabo's car. I read somewhere that Dr Akindeko is now 53, she looks great for her age BTW, and is ready to move on. Marriage when young and deliriously in love is amazing, but love and marriage when people are older can be a blessing too. I wish the couple more health, more life and more years together in their marriage.